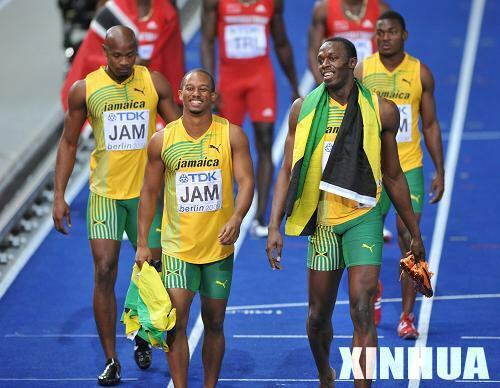 Usain Bolt won his third gold medal but failed to break a third world record when Jamaica stormed to the men's 4x100 meters relay title at the World Athletics Championships in Berlin on Saturday. Bolt, who smashed the 100m and 200m world records with jaw-dropping times of 9.58 and 19.19 seconds, ran the third leg before passing the baton to former world-record holder Asafa Powell, who anchored the race in 37.31 seconds. The time was a championship record but a far cry from the world mark of 37.10 they set at the Beijing Olympics last year. Bolt thus became the first man in history to hold three Olympic and world titles of 100m, 200m and 4x100m relay at the same time. 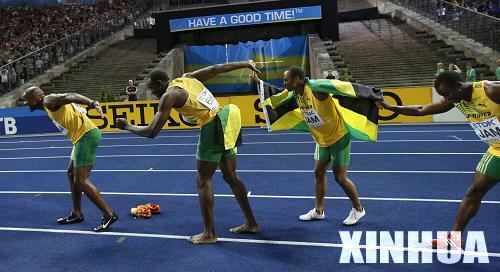 "Winning three gold medals in Berlin is wonderful," Bolt said. "I am proud of myself." He said jokingly that it is his fault not to set a third world record. "Well, it is a little bit my fault. I was a little tired." Trinidad and Tobago took silver in 37.62 seconds and Britain was third in 38.02. The Jamaican women recaptured the world crown they last won in Tokyo 1991. Led by newly-crowned 100m champion Shelly-Ann Fraser, they cruised to victory in 42.06 seconds. Fraser, the Olympic champion, ran the second leg and bagged her second title. Bahamas took silver in 42.29 and Germany third in 42.87. Poland's Anita Wlodarczyk became the second athlete after Bolt to break a world record. She bettered the women's hammer throw mark with a toss of 77.96 meters en route to the title. The 24-year-old, who finished fourth in the Beijing Olympics, achieved the result in her second attempt, improving on the previous world mark of 77.80 meters set by Russia's Tatyana Lysenko on Aug. 15, 2006.